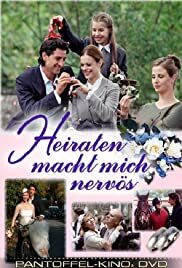 The film begins promisingly with Susan Anbeh as Nina Becker and Gregor Törzs, son of the popular television announcer Denes Törzs, as Niklas Tremsaal portraying a happy, dynamic, young couple in love. The viewer is soon introduced to Sahra Thonig as Nina's young niece, India, who portrays a girl excited by the prospect of a wedding in the family admirably. Indeed, the key role she plays in the film was, together with the aforementioned introduction to the couple, a highlight of the romantic story. As in many an amorous tale, such as 'Sweet Home, Alabama' and 'Grün ist die Heide' to mention but two, the heroine is attracted to two men, one of whom is a city slicker whereas the other one revels in the simple, but not too simple, and romantic country life. Unfortunately, after the amusing announcement by Nina's mother, Alexandra, played by Gaby Dohm, and Nina's reaction to it, the film is too unrealistic to make the gags humorous, and the characters are too sanguine to retain the modicum of credibility required to evoke romantic emotions. In particular, Susan Anbeh's performance would have been uplifting in a film in which she was faced with more minor problems than those in this tale of organising her wedding, qualifying for the Olympic Games, and deciding which man she loves simultaneously. The character of the dim-witted priest, played by Alexander Duda, was exceptionally awful, being neither realistic nor humorous, although the latter was predominantly caused by such figures appearing too often in various films around the globe. I expect that equine sport enthusiasts may well enjoy the various scenes with horses. Nina Becker, the heroine, is attempting to qualify for the Olympic Games for most of the duration of the film. Personally, I was confused by scenes of show-jumping, dressage and cross-country, but these are all elements of eventing or military, as sports lovers would know. The ending, whilst unusual, was particularly lacking in credibility; no one seemed to react in character. I love a good romance, whether dramatic or comic, but this one was disappointingly flat.